This class is for foodies, Francophiles and amateurs alike. Hear the story of Les Meres de Lyon, Madame Bouchon, Paul Bocuse and the “birth” of French cuisine. Enjoy preparing a 3-course Lyonnaise meal. Learn how to prepare clarified butter and make cervelles des canuts (a clever reinvention of babeurre by the legendary silk workers of Lyon.) Everyone will get a chance at making their own crusted rougie, the signature dish of Paul Bocuse’s restaurant L’Auberge du Pont de Collonges. Finally, learn how to properly serve a cheese plate a la Francaise. Participants will leave this class with an impressive set of techniques and recipes. What do French Mamans Serve for Dinner? Some very basic culinary skills and recipes based off my research and experiences in France. Participants will leave this class with an handful of simple, healthy & gluten free meals. 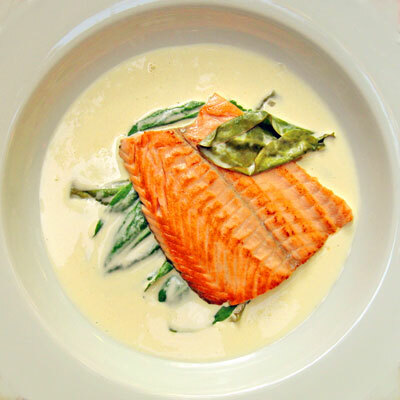 As seen on the Chef’s Table – France (https://www.netflix.com/title/80128096) which documents this family-named restaurant’s Michelin starred history and second-generation’s soul-searching journey back towards the salmon dish that gave them him his stars, you will learn how to make & properly serve this legendary dish. Not a class to miss! In this class, for beginners, you will learn the basics of how to make your very own French macarons. A naturally gluten-free delicacy, macarons are the quintessential French treat. Made with easy to find ingredients and filled with personal flair, everyone will get hands-on experience whipping, combining, piping, and filling these classic French sweets. Join me for an afternoon and you'll return home fully prepared to make your own. To the inexperienced, sauces may seem daunting; however, learning the art and the science of sauce making is a must for any French-foodie enthusiast. In this class, I will go over the art and science of the 5 mother sauces: béchamel, velouté, hollandaise, espagnole & sauce tomat. Participants will have the opportunity to practice several sauces, and together we will experiment with some derivatives. Everyone in this course will go home with the recipes and the techniques necessary to execute any brilliant sauce destined to elevate any steak/egg/pasta/etc. dish!